It has been suggested that Australian Aborigines are primitive and uneducated; animists who uses ritual to win the favour of the spirits controlling food, shelter, and fertility and to ward off malevolent spirits. Despite what sounds to the western mind as believing in superstition, these semi-nomads have shown enormous intelligence by hunting and foraging for food, and thus surviving, in extreme conditions of the arid bush-land and desert wastes for over 30,000 years. Like with other indigenous peoples, there is a sense of closeness with, and a deep respect, for the natural world of animals and plants. 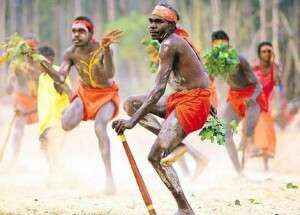 Full-blooded Aborigines in their natural state live in and are influenced by both the physical world and also by what they think of as a spirit world (dreamtime). They are not materialistically orientated like those of European descent. Their spiritual values have been reflected in a rich oral tradition of legend and ritual going back to ancient times, unaffected by Western world religion. With white settlement of their tribal lands and consequent loss of identity and self-esteem, their culture is being lost. However, there are still some initiated into their legends and rituals who know the traditional meaning of rock and bark paintings, ceremonies and oral teachings. Cyril Havecker lived close to the Warramunga Tribe and was seen as their blood-brother. He has written an illuminating book Understanding Aboriginal Culture. All Aborigines, initiated into their tradition regardless of the tribe to which they belong, share a creation myth. Baiame is said to be the supreme intelligent creator spirit who dreamed of a future that he wanted to materialise. In other words there is thought to be a purpose behind the development of the world; all living things being brought into existence with the object of fulfilling a function in the great plan of life. It is also taught that myriad portions of intelligence were taken from Baiame’s supreme intelligence; each of these being a human soul (yowie). There are said to be three inbuilt drives in each person – drives to survive, reproduce and achieve. These drives were to be the cause of all the trouble and mischief on the earth but also the cause of all that is positive and productive. Each soul was to have the will and freedom to discriminate between positive or negative action, choice being dependent on wisdom-knowledge and level of development. It was decided to give each soul a memory to prevent chaos. Associated with this creation story is the claim that the physical world is connected to a psychic dimension by character vibrations and that this land of mystery actually exists. It is referred to in their mythology as the dreamtime. The tradition teaches that the universe is a mental creation projected out of spirit essence. And so traditional healers and magicians (wirinun) who deal with spirits have been operative and are well known for their powers in extra-sensory perception and control of the mind. Induced emotion and directed thought are two powerful ‘magical’ weapons used by the wirinun. And so as part of training, such a person undergoes a strong personal discipline. This involves long periods of isolation, and restriction in diet. It is said that when in a heightened state of consciousness, such individuals make contact with the ancestors in the spirit world (dreamtime); this being possible because each individual soul has two bodies — one material and also a spirit body (dowie). It is the latter that is apparently used to communicate with the ancestral spirits. The soul is said to never leave the body of the living except at physical death, when it goes to reside permanently in the dreamtime; this dimension only being continually experienced in a spirit body as it is not somewhere in space: it is all about us and it requires only the proper conditions to be contacted at any given time. The wirinun, through training in concentration and the environment of the spirit world, use signs, symbols and incantations necessary to call up needed psychic entities. Whilst operating in what is regarded as a sacred area (bora ground) the magician is believed to be protected from demons. Such an individual never calls upon any spiritual entity with which he is not completely familiar for he says he must know their nature and aims. In fact he often uses prayers (narmingatha) directed to the supreme intelligence (Baiame). In seeking the aid of benign entities of the spiritual world he uses no words of compulsion, or extravagant terms. He asks earnestly and gives reasons. He does not ask for something that deprives people of what justly belongs to them or which gives an unmerited advantage over someone else. A lot more could be written about this fascinating tradition. However to sum up, extra-sensory perception, survival after death, and constant contact with a much more knowledgeable spiritual world, are all widely accepted facts in traditional Aboriginal culture; as is the presence of a supreme divine spirit and other spirits who affect life on earth. In fact the whole of their lifestyle is subject to supernatural forces. Is there anything here for us to learn?